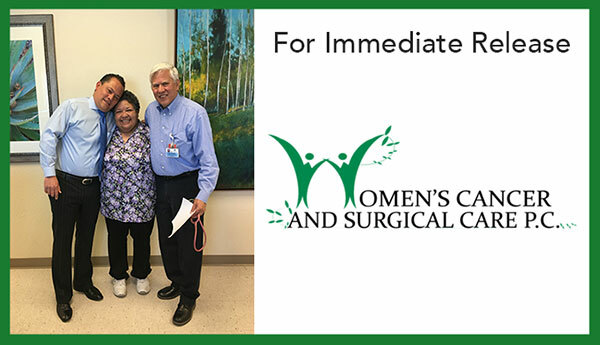 Celebrating One Year at El Paso Location - Press Release - Women's Cancer and Surgical Care, P.C. Celebrating One Year in El Paso at Women’s Cancer and Surgical Care! Women’s Cancer and Surgical Care is pleased to announce their One Year Anniversary in their El Paso, TX clinic. The dedicated team at Women’s Cancer and Surgical Care had a prosperous first year in the El Paso area. They’ve brought years of experience and expertise in the diagnosis, treatment, and quality patient care in the fight against women’s cancer. Collectively, the team of doctors in our El Paso location have treated over 1300 patients in this year alone. Dr. Luis Padilla-Paz’s interest in minimally invasive surgery through his career led him to become a pioneer in the da Vinci Robotic Assisted Surgical System. He has performed more than 900 robotic surgeries at three area hospitals using the da Vinci Surgical System. His dedication to patients has been recognized by being awarded the “People’s Choice Award” and “People Living Through Cancer” among others. Dr. Padilla-Paz brings an advanced level of expertise in minimally invasive robotic surgery to the El Paso, and southern New Mexico medical community. Dr. Marco Duarte helped recognize the need for a committed practitioner in El Paso and the southern New Mexico region. Duarte has been integral in getting the office established. His goal, as a Gynecologic generalist, is to work with his patients and their primary care providers, to optimize their access to quality care. This is especially important in regard to women’s cancer issues – the prevention, diagnosis, timely and appropriate evolving treatment strategies being his main focus. Dr. Joel Webb is board certified in both general OB-GYN and Gynecologic Oncology. Webb was trained in advanced laparoscopic (minimally invasive) surgery in addition to traditional open oncology operations. Webb also gained valuable surgical experience as a Trauma Surgeon in Iraq. Webb has many years of clinical experience, and since 2008, he has used the da Vinci robotic surgical platform for the majority of his minimally invasive cases. The mission of Women’s Cancer and Surgical Care is to maintain a culture of excellence by delivering to their patients the most advanced, timely and compassionate care possible. They are leaders in providing gynecology oncology and surgical care in a multi-specialty setting. The physicians and staff provide treatment for patients needing care for Gynecologic Oncology. They also provide minimally invasive surgery in a warm, caring and supportive environment. This past year has been amazingly successful for Women’s Cancer and Surgical Care. The doctors and staff will continue to provide quality women’s healthcare in years to come at their treatment center located at 4532 N. Mesa Street Suite 301 El Paso, Texas 79912, (915) 317-5077. This entry was posted in WCSC Latest Highlights. Bookmark the permalink.